Do you practice Reiki and have questions? Are you in a hurry to receive reliable, credible information and perspective shared by a seasoned Reiki professional? Subscribe here, and help is on its way! Perhaps you took a Reiki class but don’t feel confident to practice and your teacher isn’t available to support you. Or maybe you love your Reiki practice but you’re unsure how credible the information you’ve been given is, especially about safety or history. You might be an experienced practitioner struggling with some aspect of your practice. To me, that shows how much your practice means to you. Maybe you’re already a professional but you aren’t comfortable communicating Reiki practice, or you’re not getting the response you need to grow your business so you can help more people. There are so many reasons you might have questions. Even if you started your practice with an in-depth First degree class, you can still benefit from continued mentoring and Reiki community. My book, REIKI: A Comprehensive Guide, is a good place to start. I wrote it as mainstream introduction to Reiki practice and a continuing practice companion. It’s a book you’ll turn to again and again, not read once and put on a shelf. The index is detailed so you can easily find precisely the information you’re looking for. That was so important to me that I compiled the index myself (yes, it was a labor of love!). If you live in the New York City area or visit here, please join us for the monthly JCC Reiki Clinic I started in May 2007. Anyone who has taken at least First degree Reiki training is welcome, regardless your level of training, your lineage or your practice style. Come be part of a thriving, diverse Reiki community, sharing Reiki treatment with other practitioners and with the public, and getting a treatment — and chocolate! People who already practice Reiki and even experienced Reiki teachers often show up in my First Degree class and find it personally and professionally enriching. Revisiting the basics strengthens our relationship with practice, inspiring greater confidence and a deeper appreciation of the many benefits Reiki practice brings. I also travel, so watch Pamela on the Move, or even better, sign up for my email list and give your location so I can let you know when I’m headed your way. I offer many avenues of online support for your Reiki practice. You’ll find continuing support on my ReikiCentral blog. Look especially at the articles in the Daily Practice, Clinical Practice, and Communicating Reiki categories. The Usui Virtual Retreat will refresh you and deepen your practice, a retreat you can give yourself on your own time. WRITE REIKI is an online interactive program that uses free-writing to deepen your awareness of your practice experience and insight. The Mainstreaming Reiki Recordings address the areas of Reiki practice I receive the most questions about, including How to Explain It? Is it time to fast track your development with some focused mentoring? Perhaps you have a presentation coming up and want to fine tune it, or you need strategy to approach a hospital or business about starting a Reiki program. 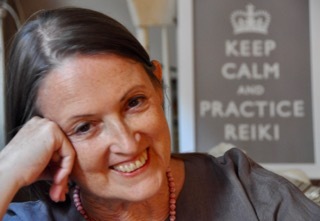 English-speaking Reiki practitioners from around the world have fast-tracked their growth with focused one-to-one Reiki mentoring sessions on the phone or Skype. This website is your online Reiki community and support system. We are constantly expanding, so please bookmark this page and return often. Email me to share additional questions you’d like addressed and tell me what other resources you need. Please subscribe here to be part of a large international Reiki community and receive my free ReikiUpdate e-newsletter, where I share special opportunities not available elsewhere. I also announce my classes and travel events through ReikiUpdate.